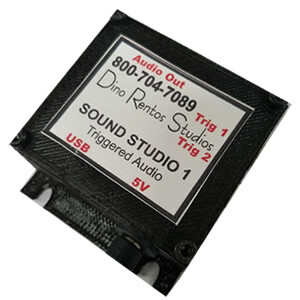 Sound Studio Audio Sound Effect Triggering Device - Dino Rentos Studios, INC. Perfect Audio Sound Effect triggered device to add audio effects to your props, displays and Halloween displays ! Sound Studio comes with 2MB of internal memory storage, inputs for 2 trigger events, USB port and power supply. Sound Studio requires you to plug in an amplified speaker. To load Sound Studio with your sound effects connect it to your PC (Do Not connect power supply). It will show up like a memory stick, just drag and drop your files to the Sound Studio.